Anatomy for Lawyers, the award winning CLE series developed and taught by Professor Samuel D. Hodge, Jr., will be expanded into a four week CLE offering that will provide a joint certificate in Medicine and Law with a focus on the most common injuries seen in a personal injury claim. Statistically, injuries to the spine, shoulder, hand, hip, knee, and foot are the most common injuries giving rise to personal injury claims.This course will focus on the anatomy of these areas and will explain how trauma occurs to each unit. The course will be a collaborative effort among the Temple Schools of Law and Medicine. 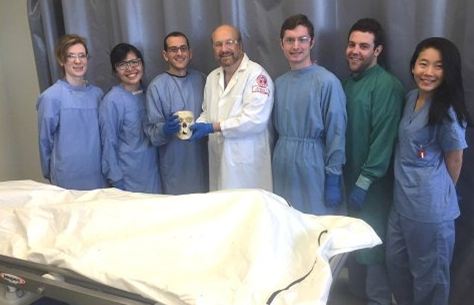 Professor Samuel D. Hodge, Jr., will co-teach the course with Dr. Virginia Graziani Lowe, M.D., J.D., Professor Steven Popoff, Ph.D., and the anatomy faculty from the medical school. Classes will be held on Tuesday nights at the medical school and will include classroom lectures, hands-on instruction, and actual dissections of the body in the anatomy lab, along with diagnostic imaging reviews. Upon successful completion of the program, attorneys will receive the appropriate CLE credits and certificates in Medicine and Law from both the law and medical schools.